One of their grandest in the country, and certainly the most impressive in the city, Taj West End is a splendid heritage hotel set amid tropical forests. 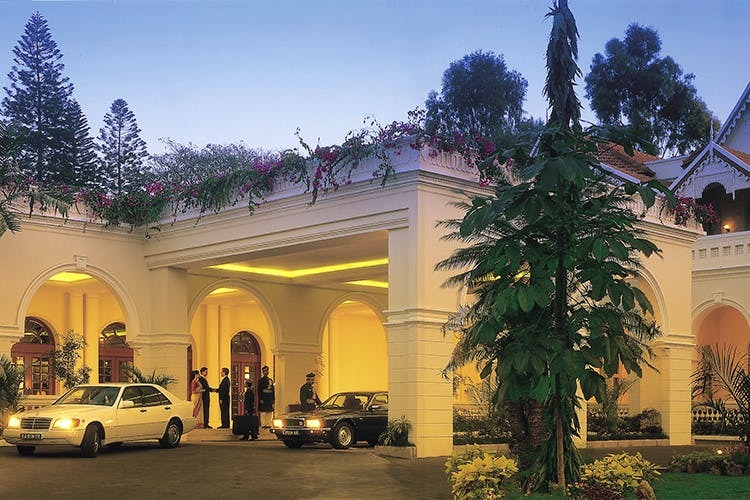 You haven’t lived the high life if you haven’t stayed at the Taj West End. OK, it’s a bit expensive. But it’s so pretty, and it’s smack in the city, though surrounded with plenty of green lawns and trees, it’s like you’ve escaped to a tropical getaway. We highly recommend a staycation here for INR 10,000 a night. Sure it’s not pocket change, but with that much history, heritage, beauty, and swimming pools you may not want to ever leave, it’s not that bad. Go on, splurge a bit for once. A heritage building with a long driveway leading to the the reception, you’ll pass a few venues ideal for events such a mehendi, an anniversary party, a reception or even perhaps. Our favourite is the Blue Ginger lawns, a lovely enclosure near the Blue Ginger restaurant. These lawns are perfect for a romantic setting with a little pond, pagodas and a fountain to boot. Of course, Blue Ginger, India’s first Vietnamese restaurant itself is as gorgeous. Head here for authentic Vietnamese food, a breezy evening, and drinks over at Blue Bar, a pavilion bar not too far from the venue or the restaurant. The cobbled driveway will lead you past a few charming cottages to the main building that houses rooms, restaurants and of course, the reception. Mynt is the 24/7 coffee shop which serves everything from club sandwiches (essential for those midnight hunger pangs), shawarma and biryani to pizzas, slow-roast chicken and fish ‘n’ chips. They also have a Mysore Maharaja menu serving up Karnataka specials. Masala Klub is the dedicated Indian restaurant with dal makhani, mutton biryani, and rann being hot-sellers. We can eat Nalli Nihari and naan here, forever. Beyond the food however, the rooms and facilities are outstanding. Check into luxury rooms, that overlook the lush gardens (all with a private sit out, to have tea at), or perhaps you want to upgrade yourself to a Grande Luxury room that is larger, and has much for natural light filtering in. But at about INR 12,000, we’d pick the club rooms for access to club lounge and the cocktail hour. If you’re up for dropping INR 17,000 a night, feel free to check into the suites that have a lavish sit out, a charming drawing room, dining area and even a little anteroom. We also love that the hotel maintains old-world charm, but with modern amenities. It’s not the most hotel kind of hotel — it’s more like a swanky cottage. The JIVA spa should keep you happy and rejuvenated. For the water babies, pick from two lovely swimming pools to lounge or lap. Unless you’re staying at the fanciest of fancy suite which has a plunge pool for guests staying there. Nothing like a cocktail, rain trees and a dip in the water. Sometimes, nothing will do but the Taj experience. Check out the striking red post box just before you enter the hotel. It’s still functional, so send a letter for the first time, in a long while!